ALL NEW RETAIL HEADS now SHIP FREE in the Continental US! Today’s small block Ford street engine builder has it easy. Not all that long ago, the small block fan’s only choice for Ford cylinder heads was the classic 351W Ford heads swap on a 302. 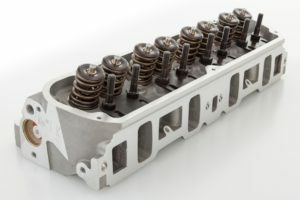 Today, the aftermarket lineup of Ford cylinder heads has plenty of castings from which to choose. We’d love to test ’em all, but we decided to line up as many performance small block Windsor Ford heads as we could find, as long as they were available complete for less than $1,350 for the pair. Our products are not manufactured, endorsed or sponsored by Ford, GM or Chevrolet. Our use of the terms "Ford", "GM" and "Chevrolet" and associated logos, are for descriptive purposes only. Flo-tek High Performance Racing Heads / Tristate Cylider Head, Inc.